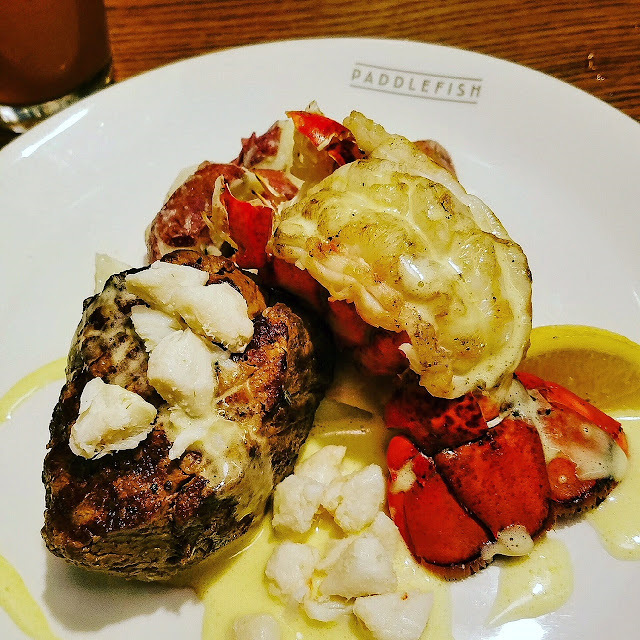 It’s the most wonderful time of the year and Paddlefish at Disney Springs is serving up some wonderful holidays specials for their guests. For Christmas (December 25), guests can enjoy Prime Rib Eye with king crab mash, baby carrots and red wine demi-glace for $44. And for New Year’s Eve (December 31), Paddlefish will be serving their Surf & Turf with filet, cold water lobster tail, crab hollandaise and herb roasted potatoes for $49 (pictured above). Reservations aren’t necessary to enjoy these specials but they can be made on their website. 0 comments to "The Holidays Have Officially Arrived at Disney Springs' Paddlefish"